What you can expect from Cooma Toyota. 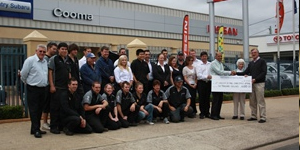 At Cooma Toyota, we strive to show a commitment to the community in which we do business. To achieve this outcome, Cooma Toyota staff are dedicated to 'total customer satisfaction' and we are all proud of our exceptionally high standards. Please take the time, to tour our website and if you have any questions, please be sure to contact us. If you are in the market for a new Toyota, our professional sales teams can offer you Australia's best new car prices, as well as having a huge range of late model used vehicles, small cars, family cars, performance cars, commercial vehicles and 4WD's. Please call in and inspect our range of New and Used vehicles, and give us the opportunity of looking after all of your vehicle needs.